Thanksgiving is America’s most renowned holiday. Dating back to 1621, when it was first celebrated between the American Indians and the Pilgrims. All Americans celebrate Thanksgiving as it is secular. Thanksgiving always falls on the fourth Thursday in November. 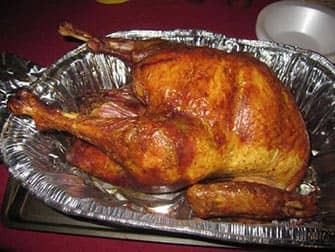 In 2019 Thanksgiving will be Thursday the 28th of November. It also marks the unofficial start of the holiday season: with “Black Friday” shopping kicking off on that very day, followed by Christmas and New Year’s Eve. The holiday signifies giving thanks, counting blessings, and spending time with loved ones. Every American has the day off from work. Unless you are one of the unlucky few that must work that day in the hospitality, healthcare or another service industry. All banks, government offices, and most businesses are closed on Thanksgiving. So, most Americans either take advantage of their day off and lie in, or wake up early to watch the parade, either live in Manhattan or on TV. Later in the day, friends and families traditionally gather at home for a big meal and to watch American football. What to do in New York on Thanksgiving? 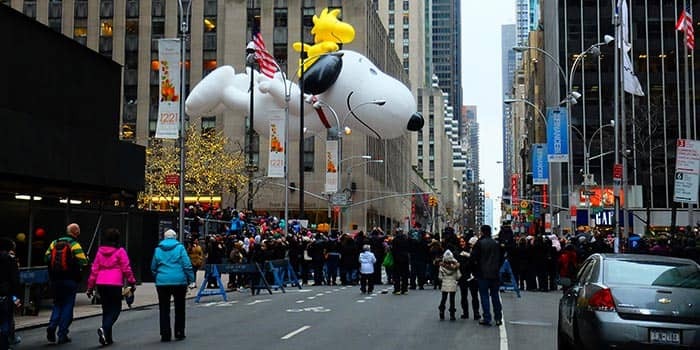 Go to the Macy’s Thanksgiving Day Parade! It’s also live on TV (channel NBC). Immediately following the parade is another Thanksgiving institution, the National Dog Show. After dinner, a popular Thanksgiving custom is to watch movies (at home or in the cinema). Since the majority of Broadway shows and museums are closed on Thanksgiving Day, you can expect the evening to be quieter and slower-paced than usual. You can start your Black Friday shopping as early as Thanksgiving evening. Do you want to be front and centre at the parade, without having to queue at the crack of dawn to secure your spot? Then book this Thanksgiving Day Parade Breakfast. The breakfast takes place in a perfect location, situated along the route on 6th Avenue. Enjoy a bagel breakfast and take in the magical parade as it passes by. If you want to do something special on Thanksgiving, then I suggest taking the Thanksgiving Dinner Cruise. You’ll be able to enjoy the Manhattan skyline at night while the executive chef cooks a wonderful meal. It’s the perfect way to sit back and relax. You’re back at 22:00, so if you’re set on shopping you’ll be able to join in the Black Friday madness. 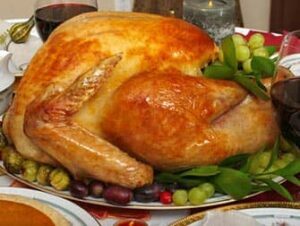 Thanksgiving is often referred to as “Turkey Day”. If you are lucky enough to be in New York, you should definitely sample some of the traditional Thanksgiving dishes. You won’t be sorry! This is a holiday showcasing “comfort food” in abundance with warm, hearty portions of meat and potatoes. Best to skip your diet on Thanksgiving, because there won’t be too many low-calorie items featured. 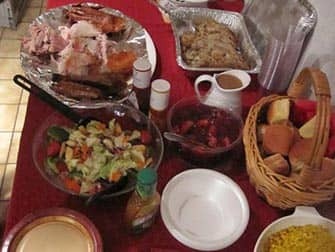 Whether you have been invited to someone’s home or are dining in a restaurant, these dishes are bound to be on the menu: turkey, stuffing, gravy, ham, mashed potatoes, cranberry sauce, pumpkin pie, yams, corn, bread rolls, and lots and lots of sugary desserts, such as pies, cookies, and cakes. Most Americans honour this special occasion by saying “grace” before the meal, which is a prayer of thanks. Eric’s Tip: I often get the question which restaurants I recommend for Thanksgiving. I am having dinner with my family, but Philip Marie, Robert NYC and Marseille are good places to go to. Restaurants often serve a fixed price menu on Thanksgiving. Reserve well in advance to secure your table, as a lot of restaurants will be fully booked on this holiday. On the eve of Thanksgiving, people are able to walk alongside the parade’s huge balloons as they lie in wait on the Upper West Side next to Central Park in preparation for the following day. Between 15:00 and 22:00, the balloons are inflated and spectators are treated with the first glimpses of these one-of-a-kind balloon masterpieces coming to life. So, if you are in town the night before Thanksgiving and wish to witness this first-hand, head toward the American Museum of Natural History on Central Park West, located between West 77th and 81st Street. There is a reason that Thanksgiving Day is the most congested day of the year. In fact, the entire weekend is the busiest time for travel in the U.S. Because of the parade in the morning, expect delays and heavy traffic jams when traveling by car or taxi in the city. Therefore, you are better off going by subway or walking, if possible. Bear in mind that all public transportation operates on a holiday schedule that day. The parade receives a few million spectators per year, so expect the city, particularly around the parade route to be the busiest in the hours leading up to the parade and just after.